Many of us like roller coaster rides for the thrill and excitement they bring. However, we don’t enjoy roller coaster rides when we are talking about the stock market. Maybe it is because when riding a roller coaster, you have the anticipation while waiting in line, the excitement during the ride, and then it’s over. With investing, there is no anticipation for when the market will swing huge amounts in either direction. We don’t know when the ride will end, and during all of this, we have the media hitting us from every angle reminding us how bad it is, how much worse it might get, or vice versa. Because of this, many of us react emotionally with our money and invest the wrong way. In order to reach your financial goals, you need stop yourself from giving in to your emotions and stay invested for the long term. But how do you do this? 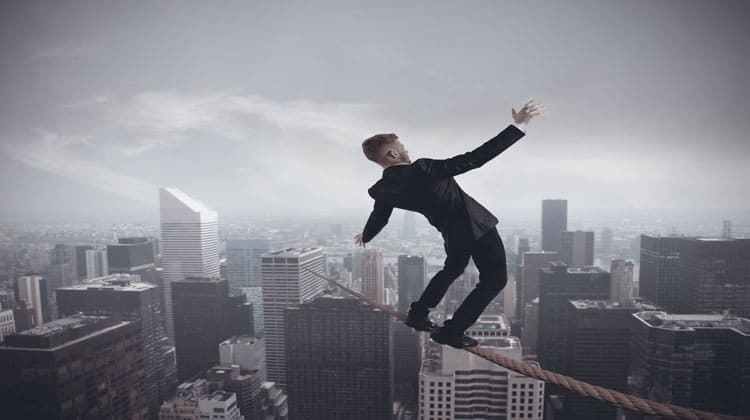 Here are 8 tips to help you survive a volatile stock market. By following these tips, you can increase your odds of making money in the stock market and not getting emotional when volatility hits, costing you money. The very first step to survive a volatile stock market is to have a game plan. By having a game plan, you will be better prepared to experience success. No successful coach goes into a game without a plan. No successful company enters a new business or develops a new product without a plan. Take the time to prepare your plan. How much will you invest? Are you investing everything at once or slowly investing over time? How will you diversify your holdings? What is your time horizon? What are you using this money for? Your plan will outline all of this and help you to better understand why you are investing in the first place. After all, the better prepared you are, the greater your chances for success. If you know what you have in your portfolio and the reasons why, it will make it easier for you to deal with a down market. If you own bonds in your portfolio and they aren’t performing, knowing that they are in your portfolio to diversify risk away from your stock investments will give you reason to continue to invest in them. When a stock I own has a large pullback, I stop myself and ask what has changed with this company. If there are rumors of potential bankruptcy, I consider cutting my losses. But if nothing changed with the company specifically and the market is dropping as a whole, I keep my position in the stock knowing that it is still a good investment. If you are like most investors, you have various accounts with various brokers. This makes seeing what you own tough. An easy solution to this is Personal Capital. When you join for free, you can see all your investments in one place and make decisions much easier. They also help you to see how much you pay for your investments and plan for retirement. You can click here to learn more. All the good times eventually stop and all of the bad times end too. The stock market is cyclical in nature. That means it rises for a bit, then falls, then rises, etc. Just look at the chart below as an example. The market swings up and down all of the time. It is never a straight line. It is critical to keep this in mind. Knowing that no matter how bad things get, it is not permanent is key in achieving long-term success. All investors make mistakes. Use that to your advantage. In my younger days, I would chase returns. I would look for a fund that had the highest one year performance and buy in. This worked somewhat successfully until the dot com bust. I lost my shirt. In fact, I lost more than just a shirt, I lost an entire wardrobe! As much as I hate that I lost all of that money, it was a valuable lesson for me. I know now to not chase returns. I invest in a basket of stocks that are solid long term performers. Recognize your mistakes and keep them in mind when you plan on making a quick investment decision. If you are 100% invested in stocks, it is going to be a bumpy ride. Take a percent of your money and invest it in bonds. Additionally, instead of investing everything you have in one sector, such as small cap stocks, spread your money around. There is a great quote that says “Money is like manure. You have to spread it around or it smells”. Investing in different sectors and investment types can help reduce your overall risk and ideally, decrease the likelihood of large losses. The easiest way to diversify your investments is by using Betterment. When you invest with this firm, they will create a diversified portfolio for you. No more worrying if you are invested correctly. They ensure you will be. You can click here to learn more. I know it is hard when stocks are dropping to think about putting more money in, but that is exactly what you should do. After all, you buy more clothes and food when they are on sale. You are happier to buy gas when the price is lower. Yet, when it comes to investing, many only want to buy when the price is highest. View stocks like gas or food or clothes. When the market drops, get excited! It’s another buying opportunity. By investing on a regular basis, you guarantee yourself of buying when the market is low. And when the market begins to rise, you will make more money because you were smart enough to buy when stocks were “on sale”. Another tip to survive a volatile stock market is to have extra cash on hand. This allows you to better handle swings in the market. When the market drops, you will know that not all of your money is tied into the market and you are losing value. It also allows for you to buy into the market when it drops. Ideally, you will keep between 1-5% of the money you have to invest in cash. You can keep it in a high interest savings online account so you can earn interest while you wait to invest. My favorite is CIT Bank. They offer one of the highest yields in the country. This means I am earning a decent amount of interest on my cash until I am ready to invest it. You can click here to open your free account. 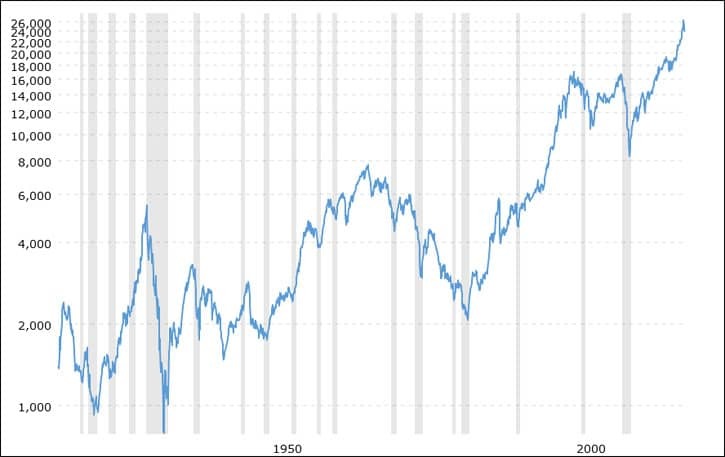 While you can’t expect the past to repeat itself when it comes to investing, the general slope of the stock market has historically been up. Look again at the chart I shared with you earlier. While the market doesn’t continuously move in one direction, over time, the long term trend is up. In fact, the market has never dropped to zero. When tough times hit, look back at how far you have come. Maybe you started off with $5,000 and now you have $15,000. Remember that you have made money and that in the past, whenever the market dropped, it came back. The same will happen again. If you can keep these tips in mind you will survive a volatile stock market and you will be a more successful investor. In time, you will see your investments grow in value. And as this growth occurs, you will experience greater gains as your money can compound faster and faster. Add all of this up and you will grow your wealth faster than you thought possible. If you want to learn more about investing, I suggest you check out my eBook, 7 Investing Steps That Will Make You Wealthy. I would add the importance of preserving capital. If the stock market trend is in doubt, Cash is the best option.